CouplingAnswers.com is an informal coupling solutions blog that was started and is managed by application specialists and engineers inside Lovejoy, Inc., a full line industrial coupling manufacturer that has been almost solely focused on manufacturing and servicing coupling users since its original flagship jaw coupling was launched in 1927. Today, Lovejoy® has countless millions of couplings installed around the world in just about every industry imaginable. For generations, Lovejoy has worked hard to differentiate itself based on superior service...and, given Lovejoy's internal team fields and answers hundreds of coupling questions every day, it seemed only natural to embrace technology, and start putting answers to the most common questions online... as a way to continue providing superior service to the world (anytime, anywhere). Given the informal nature of blogging, the Lovejoy team is optimistic they can cover a whole host of issues that wouldn't naturally fit into a traditional corporate website. We also hope the blog allows a little of our culture to leak out (something we are certainly proud of and enjoy). If you have a coupling question that we haven't answered, we certainly invite and ask you to share the question with us on this blog site. However, if the question is time-sensitive, please call or email us (the very folks who have created and are servicing this blog) directly! 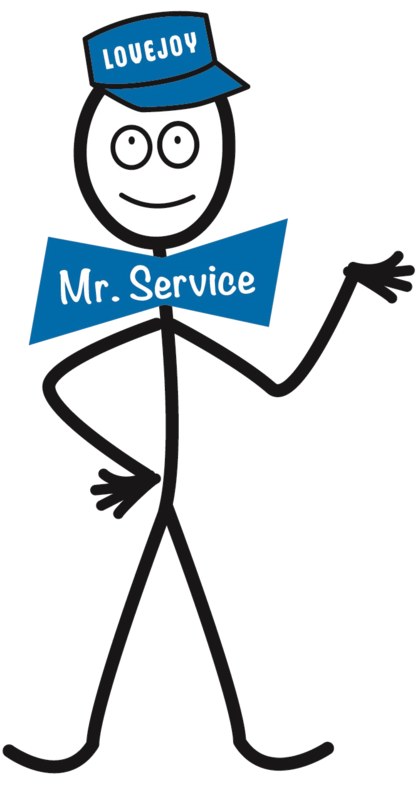 Fun Fact: The Lovejoy bow-tie logo evolved from a "Mr. Service" figure that Lovejoy used in its advertising literature going back to the 1950s. Mr. Service always wore a bow-tie with the word "Mr. Service" on it. Over time, the bow-tie grew and Mr. Service shrunk until the 1960s, when Lovejoy formally adopted the bow-tie into it's corporate logo. Bonus Fun Fact: Lovejoy's memorable name comes from the original founder of the company, Thomas Lovejoy, who started Lovejoy Tool Works in 1900 to make railroad track laying equipment and boilermaker tools for sale in the United States and Russia. The company was then sold in 1910, a full 17 years before Lovejoy would launch it's well known jaw coupling (as mind-blowing as it may be Thomas Lovejoy never actually sold or had anything to do with the Lovejoy jaw coupling! ).